Join the Club! Sound FC Now Offers Recreational Youth Soccer! 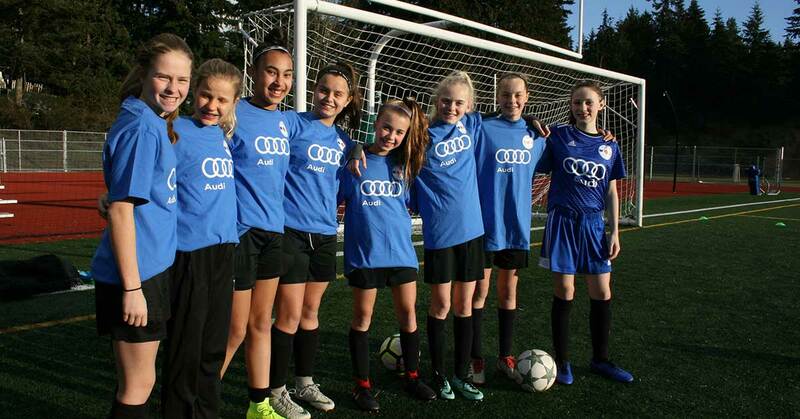 In partnership with South Snohomish County Youth Soccer Association and Northshore Youth Soccer Association, Sound FC now offers 7-aside recreational league play for players who live in the Edmonds School District. While the concept of sound minds, bodies, and skills remains at the core of our organization, recreational league play offers a more casual level of engagement. The focus of this league is to develop technical skills as well as confidence, coordination, teamwork, sportsmanship, and a lifelong passion for the game. League Season: Training begins in August. Matches run through October. 8 weeks of league play, plus a fun Jamboree on August 24th with NYSA to start the season. Additional competitions may (optional) include the NYSA Cranberry Cup in November to end the season. We’re excited to open up registration to our new rec soccer program for players born between 2009-2011. This new rec soccer league will be hosted at Ballinger Playfields or Evergreen 6 with practices taking place twice weekly. Matches — both home and away — will be held most weekends through the end of fall 2019 season. The League Fee for this program is $155. Your payment will include purchase of team jersey, shorts, socks and size 4 soccer ball for each athlete. Please contact us with any questions using the subject line “Recreational Soccer”. We can’t wait to see you on the pitch! Volunteer Sound FC coaches are trained by licensed, professional trainers and continually assessed and mentored through the season on a weekly basis. Sound FC takes coaching education extremely serious and is committed to ensuring all our athletes are being developed within the club’s coaching curriculum and standards. All Sound FC rec league teams are led by volunteers and licensed coaches. If you are interested in being a volunteer coach, please email David Hartshorn or learn more about our coaching methodology. Weekly hands-on education for volunteer coaches provided by licensed coaches. Trainings will be 1-2 times/week on Tuesdays and Thursdays with matches on Saturdays. Teams will play 7-aside with a maximum team roster of 10 players. Every effort will be made to keep players together on teams with their classmates and neighbors. Away games will be against Northshore Youth Soccer teams in Bothell, Woodinville, and Kenmore areas. Recreational game play follows the same rules and regulations as premier level soccer. Every athlete is expected to come ready to play their best game and behave as a representative of Sound FC soccer, both on and off the pitch. Can’t decide between the recreational soccer league or premier soccer? While recreational soccer teaches many of the same fundamental skills, Premier soccer offers a more intensive program designed to appeal to those athletes who may be looking to pursue the game through college and possibly to the pro level. Premier soccer from Sound FC offers guidance on athletic fundamentals including SAQ, Sports Nutrition, and Leadership as well building a path for each player that includes college preparation and guidance. The fee is $155 which includes a uniform (jersey, shorts and socks), size 4 soccer ball, registration fees, insurance, field usage, referee fees, equipment (balls and cones), etc. WHO CAN JOIN THE SOUND FC REC LEAGUE? Boys and girls born in 2011, 2010 and 2009 who live in the Edmonds School District. If you live in the Northshore School District, please contact Northshore Youth Soccer Association (NYSA). General registration will end on June 30th. Over the next 2-3 weeks, teams will be formed. After June 30th, registrations will still be accepted on a space available basis. In mid to late July, parents will be notified by email which team their player has been assigned to and the coaches name and contact information. Coaches will then contact all families with practice and game information. During registration, you will be asked for the closest elementary school to your home address. This will be used in forming teams along with special requests (buddy list). Rec League teams will play 7v7 (6 players and a keeper) with a minimum roster of 8 and a maximum roster of 10 players. Yes, as part of registration you can list a friend / buddy that you would like to be placed on a team with. Teams will be formed based on nearest elementary school. Not all requests can be guaranteed but we will do our best. DO YOU KEEP TRACK OF SCORES? Yes we will keep scores; however, there will be no league standings. The goal of the rec program is to make sure players have fun, while learning basics about the game of soccer and good sportsmanship. HOW BIG IS THE FIELD SIZE? 7V7 teams play 25-minute halves. Full game is 50 minutes with a 5-minute half-time. A size 4 soccer ball will be provided to each player as part of registration. Uniforms will be provided by Sound Football Club. During registration, you will select the sizes of your player’s jersey, shorts and socks. Training begins in early August and will take place on Tuesdays and Thursdays in late afternoon / early evening. Games will be played on Saturdays beginning Sept 7th then 7 more Saturdays ending on October 26th (total of 8 games). Trainings will be held at Ballinger Playfield and Evergreen 6. Home matches will be played at Ballinger Playfield or Evergreen 6 and inter-league matches with NYSA teams at Woodinville Sports Fields. IF I VOLUNTEER TO COACH WILL I HAVE HELP FROM THE CLUB? Yes, volunteer coaches will meet with the Rec League Director in late July. Then on a weekly basis, team coaches will receive guidance from the Sound FC licensed coaches. WHAT IS ACADEMY STYLE TRAINING? During a training session, Sound FC’s licensed coaches will work with pools of players and volunteer coaches to deliver session topics and methods before players branch off to their designated team / coach. MY CHILD NEVER PLAYED SOCCER BEFORE. IS THIS A GOOD FIT? The Rec League offers a more casual level of engagement. The focus of this league is to develop technical skills as well as confidence, coordination, teamwork, sportsmanship, and a lifelong passion for the game. Perfect for those players new to the game and/or who want to play with friends and neighbors. WHAT IS THE NYSA JAMBOREE? Sound FC Rec League teams will have the option of participating in the NYSA Jamboree to be held August 24th, 2019. More details will be distributed as they become available. WHAT OTHER TRAINING OR COMPETITIONS WILL BE AVAILABLE? Sound FC Rec League teams will have the option of playing in the NYSA Cranberry Cup held Friday, Saturday and Sunday over Thanksgiving weekend. More details will be distributed as they become available. To register, click on the REGISTRATION button at the top of this page. During registration, you will need to upload a copy of your player’s birth certificate (or passport) and a photo (headshot). You will also be asked to answer some medical questions and enter your medical insurance info, so have that available. When registering, select the gender/year of your player, for example, if your son was born in 2010, select the Sound FC Rec B2010 team. Teams will be formed from this list of players. Sound FC awards financial aid based on a family’s financial need. Please see the financial aid application for the complete list of instructions and the income eligibility chart. If approved, the fee will be reduced by 50%. Refund requests need to be submitted to the Club Registrar by email. Please note name of child, date of birth, coaches name, parent name, phone, mailing address, reason for request. Requests received by Aug 15th will receive a refund less $25. Requests from Aug 16th – Sept 6th will receive a refund less $50. No refunds will be processed after Sept 6th.